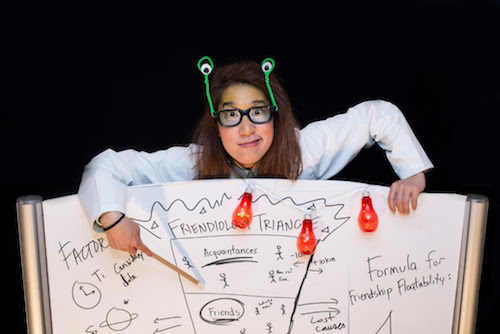 The original title of Will You Be My Friend, a Green Light Arts production now playing at the Theatre Passe Muraille Backspace, was Janice Lee and the White Supremacy Showdown. Both titles fit the work, but the former was used for marketing reasons, “so that you would come,” Kitchener-Waterloo playwright and solo performer Janice Jo Lee says. Lee’s brutal honesty, surrounded by appealing songs and humour, makes the show an iron fist in a slowly-removed velvet glove. At the start of the play, Matt White, the play’s appropriately-named white male director, reads a land acknowledgment, with Lee quietly entering and being introduced off to the side. We get a sense of the juxtaposition that’s about to happen when White goes off-script with a “ladies and gentlemen,” and his binary wording is immediately corrected by Lee. White nods, saying he should have stuck to the script. It’s this mixture of wanting to please others but eventually being unable to stay silent or complicit in her own erasure, despite what the world demands of her, that characterizes Lee’s powerful play. Lee introduces us, early on, to the concept of Westian Friendiology: an alien scientist from Pluto, Dr. West (designated by a lab coat and extra-eyed headband), has observed from his studies of “hoomons” that white people are more likely to succeed, have money, and make friends. Therefore, to help People of Colour realize their dreams, West has created a several-step program of assimilation that he takes us through in detail. West’s subject is, of course, Janice Lee. Beginning by reliving a moment from childhood where nobody would be her friend despite desperately sung offers of bubbles, jump rope, and shrimp chips, Lee initially submits to the program. She’s provided with a white activist boyfriend, complete with woke ideology and WWOOFing experience, Patagonia hiking and canoeing gear provided by his parents, and job at a Christian non-profit with a white saviour complex. Lee tries to win his approval, but it becomes increasingly difficult when he shuts down over even the smallest correction, such as the fact that feminism doesn’t mean berating women who choose to wear makeup. She finds it harder and harder to stay in the shadow of the narrative that hundreds of years of white supremacy and colonialism have created, despite Dr. West’s zealous removal of enemy agents who attempt to convince Lee to stay true to herself. The set, designed by Julia Kim, gives us a frame that separates most of Lee’s world, festooned with a plant, coat rack and other items that look almost as if they hang in midair, from Dr. West’s lab in the front. As Lee begins to embrace her anger, frustration, and exhaustion more and more, she takes up more of this front space, and the fluffy clouds in the background area begin to seem as if they might rain. Lee’s performance is audience-participation-heavy, including privilege-checking surveys to fill in at the beginning (in exchange for candy); we’re counseled about our role during the show and our ability to opt out if needed. Even if you don’t find yourself up on stage as an example of privilege, you will likely find yourself snapping, clapping or singing along, or answering a gentle or pointed question. I almost wished there had been more audience participation (a very unusual wish for me) and use of the surveys; so much time was spent on the boyfriend that it felt like the role of the second audience character, a new female friend, wasn’t explored as much as it could have been. Lee’s torrential spoken-word breakdown at the end was so powerful that I also wanted more of it to contrast what had come before. However, the show is resolute in refusing to adapt to culturally imperialist notions of structure; the seemingly simple narrative of the beginning is mostly there, like everything else, to draw an otherwise potentially wary audience in. Also accessible are the show’s 15 songs; Lee has a beautiful voice, and the numbers, such as one that lists the many ways white people are hard to love, are so catchy and bouncy that you might forget for a second that your privilege is being eviscerated. In particular, a song where she accompanies herself a cappella via loop pedals and a janggu, a traditional Korean drum, is glorious. Will You Be My Friend is a necessary show. It’s guaranteed to be a conversation-starter for some very uncomfortable but important discussions. But – what are you still listening to me for? I’d like to, as Lee encourages the audience to sing near the end, cede this space and power, and just encourage you to go hear her story. Will You Be My Friend plays at the Theatre Passe Muraille Backspace (16 Ryerson Ave.) until November 11th, 2018. Shows run Tuesday-Saturday at 7:30pm, with Sunday PWYC matinees at 2:00pm. Tickets are $17-33 and can be purchased online, by calling the Arts Box Office at 416-504-7529, or in person. Every performance of Will You Be My Friend is designated as a Relaxed Performance, meaning that the house lights are dimmed but not off, audience members are free to exit and reenter at any time, and there is a designated calming station in the Passe Muraille lobby. The 2:00pm performance on Sunday, November 11 is an Audio Described performance for the visually impaired.